Mullen, Winthers & Cerny, P.C. Maria G. Antoniolli, or “Gabby,” grew up in DuPage County, attending Hinsdale South High School in Darien. She went on to attend the University of Illinois Urbana-Champaign and,after graduation, Gabby was hired by the DuPage County State’s Attorney’s Office where she worked as a legal secretary for one year prior to attending law school at The John Marshall Law School in Chicago. 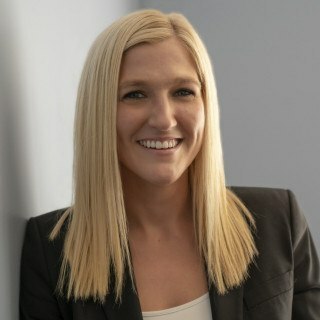 She earned a Juris Doctorate in 2012 and, after passing the bar exam, she was welcomed back to the DuPage County State’s Attorney’s Office as an Assistant State’s Attorney. She began her career at the State’s Attorney’s Office handling traffic and misdemeanor cases, including DUIs, domestic batteries and orders of protections. From there, she was promoted to the Felony Juvenile Division where she managed hundreds of juvenile files from intake to disposition. During her time in this division, she also worked closely with DCFS and became well-versed in the various aspects of cases involving abused, neglected, and dependent minors. She continued her advancement into the Felony Trial Division where she handled a range of serious felonies, from felony DUIs and drug crimes, to felony violence charges, with and without weapons involved. Since joining Mullen, Winthers & Cerny, P.C., Gabby's concentration has been in family law and criminal defense. Gabby has handled numerous pre-decree and post-decree divorce cases as well as paternity, child support enforcement, and contested cases involving the allocation of parental decision-making and parenting time. Gabby’s extensive courtroom and trial experience have shaped her into an innovative and zealous advocate who is highly effective at developing case strategies in order to achieve the best possible outcome for her clients. From engaging in plea negotiations to litigating a case at trial, Gabby tackles each case with tenacity and an analytical mindset, while keeping the client fully informed every step of the way.